Edmund Gould was born on 5 November 1817, the son of Edmund Gould 1782-1833 of Pilsbury Grange and his wife nee Margaret. He was baptised at Hartington on 10 November 1817. Edmund Gould died on 23 August 1859 aged 41 years (1). He was buried at Hartington on 27 August 1859, where there is a gravestone inscribed to his memory and that of his parents and sister Catherine Gould. 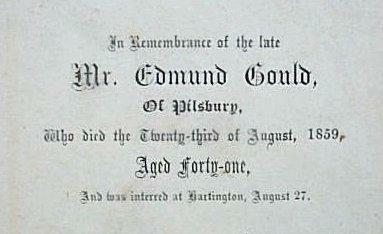 (1) "On the 23rd inst., at Pilsbury Grange, Hartington, Mr. Edmund Gould, in his 41st year." Derby Mercury 31 August 1859.